We value our clients' experience at Exotic Animal Care. If your pet or animal is currently a patient, please feel free to complete the following Client Experience Questionnaire. The Questionnaire is in Adobe Acrobat format, and requires the free Acrobat Reader to view. Many vets say they work with bunnies, but they don’t! I had two terrible experiences with vets that almost killed my little rabbit. When I found Dr. Kanfer, I was desperate! THIS IS THE MOST WONDERFUL DOCTOR …EVER!!! She is the leading expert and immediately knew what to do to save my girl. She genuinely cares for these animals. Plus, everyone at the clinic was so kind and gentle with my little rabbit. I’m so deeply grateful to Dr. Kanfer. I love my rabbits and Dr. Kanfer is the bunny whisperer. She knows everything about rabbits and was able to help my two bunnies. Dr. Kanfer also helped me with my boy (when she was booked) when I went to another vet and I was still able to call Dr. Kanfer who actually called the vet I went to and talked about my bunny’s status. And of course, I followed up with Dr. Kanfer. I have known Dr. Kanfer since she first started at Dr. Domotor’s. Over the years, I have been very impressed and thankful for her abilities and caring attitude for my small animals including guinea pigs and rabbits. I have a private guinea pig sanctuary, where the old, infirm, injured and un-adoptable animals can live out their lives in comfort. Without Dr. Kanfer, I would not be able to accomplish this. One of the major problems with these guinea pigs is scurvy and the related health issues, like congestive heart failure. There is only one other vet in Southern California who was familiar at all with these problems. When I approached Dr. Kanfer with the information and case studies on heart issues, as usual, she was more than willing to learn about it, even from a “civilian”. She also has gone to many specialized seminars about guinea pigs and is now the authority in this area on guinea pigs and their health problems.This being said, Dr. Kanfer is the only vet I have ever met who honestly cares about her patients and their owners to the point she is always accessible, even after hours and when she is on vacation! She had me come over to her house late at night, on a weekend, to treat a sick animal. Dr. Kanfer has been with me through many traumatic situations and is always there to comfort my animals and me in a very professional manner. I really can’t say enough about Dr. Kanfer, her enthusiasm, her caring attitude, her knowledge and abilities. She helps out the rescues and is dedicated to the well being of our animals. Many of my pigs and rabbits would never have survived without her. Dr. Kanfer has been my veterinarian for 8+ years. She is an excellent exotics vet and I am so glad I found her. Mainly I have come to her with ferrets but I’ve also come in with mice, pigeons and other things as well. I’ve also been at the hospital while she has treated pigs and goats. It’s comforting to know that when I have an animal in need, she’s there. There are so many reasons that I bring my animals to her. She attends many exotic animal seminars and is therefore always up to date with the most recent treatments. She shows a true interest in wanting to learn more about how to care for the animals she treats. She is also extremely compassionate to both the animals and their owners and always has the animal’s best interest at heart. In addition to educating herself, she teaches you what you need to know to take care of your animal. She’s taught me how to temporarily care for a bird when I brought in an injured wild pigeon, care for mice during a variety of ailments, give Sub-Q fluids, and many other things. I’ve been her client during both good times and bad. She’s been there for everything from annual exams and mild sicknesses to chronic illness and unfortunately death. I value her expertise so much that I have followed her to any hospital she has been at even when it has been a bit of a drive. She puts her all into helping your animal be happy and healthy as long as possible and to helping them (and you) through their passing. I can’t recommend her enough. Dear Dr. K, Amy and Staff, Thank you for taking such wonderful care of me. I gave my moms a scare with my emergency. Now I am feeling so much better. I am their little angel from Heaven. Bunny kisses. Thank you Dr. Kanfer for all the bunderful work you do for all of us exotic critters! And special thanx for fixing my husbun Hanz-now we can be together forever. Nose bonks to you. I really appreciate everything Dr. Kanfer does for my 9 bunnies, she is definitely a unique Vet that takes caring for rabbits’ health to a higher level and beyond office hours. My clients and I feel blessed to have such an amazing Vet in our Rabbit Community! Thank you very much Dr. Kanfer & Staff!! Dear Dr. Kanfer, Dr. Margolin, Lori Ann, and the entire staff – Thank you so much for looking after Adam and all the other bunnies. Your devotion and service to the animals has helped them immeasureably. Every time I am in your office everyone is so helpful and attentive. I am quite lucky that you’re my veterinarian and that you are supported by such a professional staff. 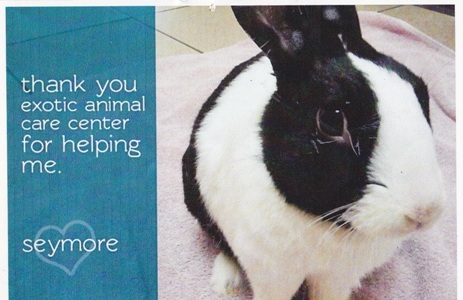 Thank you for your excellent care of our bunnies, we love you all! Thank you for keeping Danger alive to enjoy his sixth Christmas with me. He’s the greatest gift. Thanks so much. Dear Dr. Kanfer and Staff-On behalf of Victoria we would just like to say “Thank You” for your wonderful care. For us we would like to say again “Thank You” for giving of your time and expertise. Many, many thanks. The compassionate, knowledgeable care that Dr. Kanfer, Dr. Margolin, and the staff at Exotic Animal Care Center (EACC) provide to my small exotic animals is invaluable. Dealing with everything from a beak trim (for my Russian tort) to health certificates for small exotics being transported out-of-state to rabbit health emergencies, Dr. Kanfer, the vet techs, and the front- and back-office staff have always been kind, supportive, and understanding. Even better, they are experts when it comes to all things health-related for exotic animals. I am not exaggerating when I say that Dr. Kanfer’s intervention has saved the lives of several of my rabbits. She knows her stuff, researches topics when she’s uncertain, and is always up-front when discussing diagnoses and treatment options. I never feel like I am being coerced into expensive, unnecessary treatments and always know that I am being given the information needed so I can make an informed decision about my animal’s care. I really wish I could give more than five stars to EACC – they deserve all the stars in the universe for the work that they do, the love and compassion they show, and the care they provide. Dr. Margolin – I just wanted to say “Thank You!” Words cannot express how grateful we are for everything you did to take care of my little birdie Baby and for all of the steps you took to try to save her life. You are such a caring person and we knew that Baby was in good hands. She was and still is very precious to us and it was a comfort to know that she was being take care of. Thank you for all of the love, care, and attention you gave her. It means so much to us. Thank you again!